Barcelona – European Conquerors No More? On Wednesday night AC Milan defeated Barcelona in the first leg of the super 16 stage of the Champions League. They take a 2 nil advantage going into the reverse fixture at the Camp Nou and there can be no mistaking that it is deservedly so. The Rossoneri were the better team on the night. They defended well to reduce space and angles for Barca to offer many meaningful interchanges in and around their penalty area to threaten their goal. And when the opportunity presented itself, they stole possession and burst forward to attack with a bravery rarely seen against Barcelona. As AC Milan poured forward on the counter attack it was the decision making of the advanced players that separated the two sides however. Seldom were balls squandered or opportunities not seized upon. This was simply not a classic case of catenaccio, thedefence-first method of play made famous by city rivals Inter in the 1960’s, by an Italian team in Europe once again. Instead it was a demonstration of how intelligent use of the ball and a positive approach shown through the supporting runs made by players, can defeat any team. After Chelsea’s success last season, AC Milan looked to have perfected the anti-Barcelona formula. So the question to be asked is, is it the beginning of the end for FC Barcelona’s dominance in Europe? It is my belief that the result at the San Siro will ultimately prove a good thing for Barca. After Frank Rijkaard’s Champions League winning success in May 2006, the team unravelled and stars like Ronaldinho, Deco and Rafael Marquez embraced the party life too much and their form suffered. When Pep Guardiola was appointed as head coach in June 2008 he swiftly transferred out the aforementioned trio and changed the attitude within the dressing room. The team played with pride, defended their principles and fought for space and possession all over the pitch. The nucleus of that all-conquering, 6 trophy winning and history making squad of 08/09 season remains today. As their 12 point lead at the top of La Liga suggests, their hunger for success has not changed. This is a test of that. For Pique still believes Barcelona will progress. His mentality is still the same. Catalonia still believes they can do it too. In fact, very few doubt that they couldn’t, not outside of Milan anyway. When we look back at great sides of the past our nostalgic minds always play a trick. There are no clubs at this level that complete a season undefeated across all competitions and nor do they win every game. They all face adversity but the measure of their greatness is for that season they overcame it too. The Manchester United treble winning team of 1999 were beaten 3-0 by Arsenal in the Premier League long before the title race was won. The aforementioned Barcelona side of 08/09 lost back to back league matches to Espanyol and Atletico Madrid. Citing these two examples, I advocate that results like this while painful for Barcelona supporters now are small setbacks for clubs that are on a clear path to success. The danger of defeats in the Champions League, especially during the knockout stages, is that with them comes a much higher media glare and scrutiny than is seen in domestic losses. The result will have meant that the warning light will have been switched on for Barca and questions will be asked of them. As Wednesday night showed, even the greatest player in the world can have an off night and when it came Barcelona couldn’t find a Plan B. Guardiola brought in Zlatan Ibrahimovic as an alternative but when it became clear that Messi would continue to grow into the record breaking monster he has then the Swede’s presence risked impacting on his progression. David Villa’s injury problems of late only served to highlight the growing issue. For the foreseeable future of course, Messi will continue to be Barcelona’s best asset and decide matches with his magic but there will come a time when either injury or loss of form dictates that his goal rate slows and his effectiveness or lack thereof hinders the team. Barca will one day have to seek an alternative source. He is only human after all. 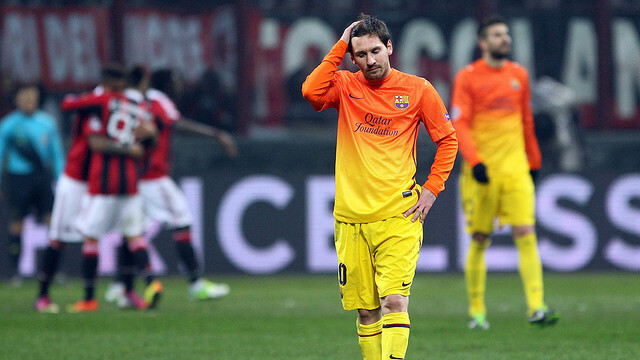 This season AC Milan have not lost by more than the two goal margin needed for Barcelona’s automatic progression. Therefore the most pressing query to Barca is whether the character of the squad instilled from Guardiola’s era remains. Can the players respond with renewed vigour and hunger to overturn such a deficit and play their way to success? On six occasions this season they have fallen a goal behind and won matches (Granada, Atletico Madrid, Alaves, Celtic, Sevilla and Osasuna). They have also won by three or more goals a staggering 12 times already this campaign. And in the 36 games they have played so far they have scored 106 goals which equates to a 2.94 goals per game ratio. The statistics prove that the return leg is now the perfect matchup and ultimate test for both teams. But win or lose, it will not be the end of the Barcelona era. After last year’s La Liga triumph for Real Madrid they have fought to virtually secure the title back by February. Losing is a lesson. It is also a reawakening of their desire and appetite to regain what was once theirs. The focus was principally La Liga this season and with it now in reach, the beast that is Barcelona may just give AC Milan its full attention on Tuesday 12th March. My money… Messi. Not Milan. This entry was posted in Analysis and opinion and tagged ac milan, barcelona, champions league, guardiola, ibrahimovic, kevin prince-boateng, la liga, last 16, messi, muntari, pique, ronaldo, serie a, vilanova, villa by Scott Jenkins. Bookmark the permalink.